A clean up gently cleanses, exfoliates and moisturizes the facial skin. Steaming the face gently clears the ugly blackheads and whiteheads. Regular clean-ups can prevent and reduce skin problems. The skin is first cleansed under steam; and then scrub granules are massaged over the skin very gently. After removing the scrub, another creamy cleanser is applied and the skin is exfoliated further with a soft rotating electric brush and massaged. These are recommended for all skin types and can be done on people under the age of 25. The basic advantages of this kind of a facial are that it reduces tanning of the skin. It also removes dirt and blackheads and then provides a clean and glowing complexion. These facials are a simple cleanse, steam and massage affair. They`re the least expensive of all facials. They`re also the best option for normal skin, which is not prone to acne. The difference between these facials and a clean up is that the skin is massaged for a longer period of time in a facial. These are a step-up from the normal facial. Specially formulated hypoallergenic creams are used to moisturize the skin. 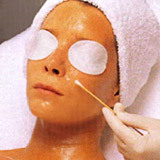 Face packs are applied depending on the different skin types and special cleansing and rejuvenation techniques are also a part of the process. These are recommended for people with sensitive skins. This is a treatment for teenagers and adults who suffer with troubled skin, mostly acne. After cleansing this treatment begins with enzyme or glycolic acid exfoliation and a warm vapor mist, followed by extensive manual deep pore extractions, electric disencrustation and a skin-calming, anti-bacterial mask. This facial should be performed at regular, two-week intervals until the problem clears. This type of facial includes the use of a multi-phase technique of exfoliation, warm vapor, deep pore cleansing, lymphatic drainage massage and self healing mineral or paraffin masque over a freeze dry collagen sheet to ensure the ideal hydrating effect. Normally in this kind of facial, liquid nutrients in the form of vials or ampoules are used and for quick absorption of liquid nutrients in the skin, laser or galvanic treatment is done. This is an effective preventative treatment against harmful environmental damage, wrinkles and dark circles. And definitely recommended for all skin types. In addition to the cleansing, massage and rejuvenation techniques, these facials include treatment that targets dark circles under the eye. The characteristic of this facial is the bio-mask, which tones and tightens the skin on the face, making it look younger. These facials are offered as part of bridal beauty packages. It involves the application of a special paraffin mask on the face over layers of gauze, which helps seal in the special anti-aging and rejuvenating creams applied to the skin. It aids better absorption and brings back the radiance of the skin. AHA acids, which are derived from fruits and flowers, are known for their anti-aging effects. These facials use creams formulated with AHAs, which help the skin look smoother and healthier. They are also recommended for people who have pigmented skin, and are prone to wrinkling easily. In these, creams containing flower extracts are used, which improve action of the capillaries, skin texture and tighten pores by generating the relaxation and calming of the mind. In ancient times, the fragrance of rose, lavender, jasmine, neroli, etc., was used to cure depression, insomnia, anxiety and other mental states. Fresh fruit facials are done with pulps of fresh seasonal fruits (orange or sweet lime pulp). Fresh fruit facial is very good for very sensitive skin, which cannot tolerate any chemically prepared cosmetics. Fruits are chosen according to the skin type: Bananas for dry skin and orange for oily skin. This facial uses creams and masks enriched with free-radical fighting agents like Vitamin A, Beta-Carotene and Vitamin E. Pollutants are first removed and the skin is then, deep cleansed in this procedure. This is recommended for people working outdoors. In these facials Galvanic gadget is used, by which a steady, direct galvanic current is utilized, to introduce water-soluble substances through the skin. It heightens the skin`s capacity to absorb and improves the penetration of the products. The treatment of specific problems becomes easier. These benefits dry, dehydrated skins, improving moisture retention. It also helps to remove congestion. These kinds of facials make use of creams containing 24-Carat pure gold, which penetrates the skin easily. It is a powerful rejuvenating treatment. Gold has a powerful effect on the lymphatic drainage, facilitating the removal of toxins and wastes. This accelerates the regeneration of new cells. Masks, containing gold, are also applied. The gold facial helps to restore youthful qualities, like softness, smoothness, elasticity, resilience and radiance. In these kinds of facials, essential oils are used, which have potent and specific curative properties that are of particular benefit to the skin. They are effective for relaxation of body and mind. Aromatherapy facials help clear skin congestion and improve the normal functions of the skin. The mask, which is applied at the end of the massage, also contains essential oils. The elimination of toxins, the improvement in the skin`s normal functions, including cell regeneration and the uplifting effect, all combine to make Aromatherapy facials revitalizing and rejuvenating.